Ubiquity offers a whole new kind of education designed to empower you to successfully deal with the challenges of our time. Unlike traditional universities, we have expanded the focus of learning to include not only the acquisition of Knowledge but also the cultivation of Self Mastery and the development of change projects for social impact. All this constitutes what we call our Integral Learning System. At Ubiquity, we believe that you learn with your head in the acquisition of Knowledge, learn with your heart in the development of Self Mastery, and learn with your hands in how you want to impact and contribute to the world. All dimensions of your life need to work together for you to reach your highest potential and have a positive impact in the world. Knowledge: Learn how to think and observe. Learn about the state of the world and the forces shaping the future. Self-Mastery: Look inwards. Understand your strengths and weaknesses. Seek excellence. Unlock your potential for peak performance. Explore your capacity to connect with the larger whole. Impact Project: Turn your passion into action. Link what you love with what you do. Collaborate in a global network of activists, and apply what you are learning to change projects in communities everywhere. At conventional universities, Knowledge acquisition is 100% of what counts. At Ubiquity, Knowledge acquisition accounts for 30% of your overall credit toward the certificate or degree you are seeking while Self Mastery and Impact work also count for 30% each. An additional 10% is awarded for your capacity to collaborate, making 100%. All components are essential for holistic growth and development. Ubiquity courses come in a variety of shapes and sizes to suit your needs. Trimester Courses unlock the full depth of the Ubiquity experience. These for-credit courses last 3 months and grant you access to course facilitators, impact and personal mastery coaches. You will earn skill badges that recognize your new competencies. The best part? You can stack your badges over time to unlock higher credentials such as Certificates, and even Bachelor’s and Master’s degrees! Micro Courses are shorter experiences designed to achieve particular competencies outside of the standard trimester term. These 1-month courses begin on the second Monday of each month and are equivalent to 1/3rd of a normal trimester class. For this reason they are more flexible while still resulting in badges and professional credentials. Lite Courses are “lite” versions of our Trimester and Micro offerings. These non-credit courses can be completed at your own pace while still unlocking lower-level points and skill badges. Are you interested in gaining skills and credentials but don’t need academic credit or the full hands-on experience? If so, Lite courses are for you. And don’t worry! If you change your mind later you can complete the full course assignments to gain academic credit toward a higher credential. Immersive Trimester Courses are trimester courses taken for non-credit that still grant you access to Ubiquity’s full range of learning resources. You should take this course if you are interested in mastering a certain competency and skill badge outside of our certificate and degree offerings. As you will have completed the full curriculum, these courses may converted into academic credit later by simply paying the difference between the Immersive and degree-level course fee ($50). Check out our Course Pricing page for a full list of prices. Ubiquity has developed a gamified learning system that enables you to build points – just like in a video game! As you learn more and earn credentials, you will “level-up” your profile and moves closer to certain badges, certificates and degrees. In our Trimester courses you can earn up to 10,000 points. Other kinds of courses give you other totals, but all your learning will yield points. Every single assignment within your courses unlock points that you can build on. As you go through your Ubiquity experience, you will develop competencies and earn badges, credentials and degrees, depending on your learning pathway. Quite simply, you are competent at something if you can do that something successfully and efficiently. A competence can be about an inner quality like emotional or relational intelligence or it can be about any professional expertise. It can be around your capacity to think organizationally or strategically. It can be about your artistic talent. All of these areas are important for a person’s well-rounded development and their ability to make a positive impact in the world. 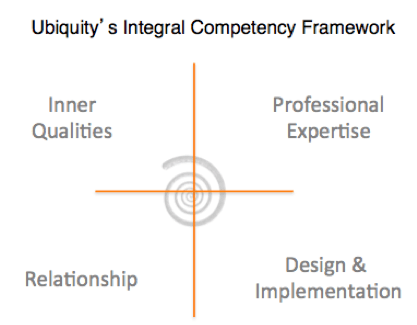 Ubiquity offers credentials for the competencies you develop in these domains. 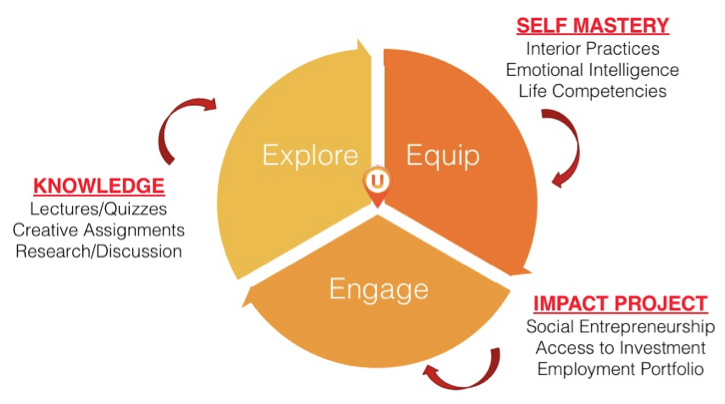 Ubiquity’s mission is to enable people to develop and demonstrate changemaker competencies. Changemaker competencies are the kinds of qualities and skills you need to bring out your optimal human potential in tackling the pressing problems of our time. You are coming of age at a very critical moment in the human journey, when we must solve critical global challenges such as runaway climate change. If we fail, we may lose human civilization itself to the ravages of extreme weather and the massive exploitation of people and the planet. You are at Ground Zero for human history and you have an opportunity to make a contribution to making the world a better place. Critical and Integral Thinking The ability to critically assess and value something in its own right and identify its place in relation to everything else in such a way that everything is able to be transcended yet included in a full embrace of life. Scientific Discipline The ability to systematically study the structure and behavior of the physical and natural world through observation and experiment in such a way that as much of our relevant reality as possible is taken into account. Each course or program you take at Ubiquity is competency-based. You will know what competencies you are supposed to achieve at the beginning of each course and you will be assessed and helped as you go along. Upon completion, you will be awarded a Badge and/or credential. Soon you will have a “stack” of competencies and credentials. Throughout your learning journey at Ubiquity, you will build your competencies. You will earn numerous badges and credentials to put in your portfolio. Competencies are becoming increasingly important in today’s job market as employers look less towards the title of your degree and more towards what you can actually do in the workplace. As you demonstrate different competencies at different levels, you unlock points towards badges and credentials. These can then be stacked toward building your portfolio towards the academic or professional qualification of your choice. We keep track of your development and guide you in the selection of content that will help you get the credential you want. Any time you demonstrate a competence, you have the opportunity to unlock badges and credentials that you can share on your LinkedIn profile,other social media and to employers. Before you know it, you will be earning Badges, Certificates and Degrees that demonstrate your capacity to make a difference in the world. And you will find that you are doing this with friends and colleagues from all over the world, working together to solve global problems. Life presents learning opportunities in many different forms. At Ubiquity, we enable you to combine learning from many different sources towards the credential or degree of your choice. We want you to consider the whole world as your classroom. We refer to these experiences as Independent Studies. They can take the form of courses or internships you take outside Ubiquity for which Ubiquity will give you full credit. Receive badges and points towards your credential. Congratulations! We encourage all our students to experience internships in sustainable living through our network of organic farms, ecovillages, intentional communities and retreat centers where you can stay as part of your own learning journey. You can do this on your own or with fellow students. You design exactly the kind of experience you want, and at the end you will express what you’ve learned through the medium of your choice: either a paper, a video presentation, or any other form of artistic documentation of your experience. You will submit this for credit toward your degree or certificate. Take a look at our global map of internship destinations and a sample list of a few of the 1000s of intentional communities aiming to live sustainably in a healthy relationship with their local ecosystem. Watch Jim Garrison, our CEO and Founder speak about Ubiquity’s exciting opportunities for learning and travel.